On Monday May 1 thousands of workers nationwide will take part in anti­-Trump or pro-­immigration protests. This will present a challenge for employers to keep their cool with employees who desire to express themselves, and their business running. 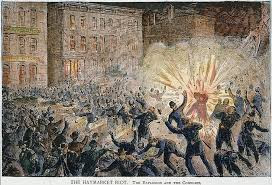 Monday is the 131st anniversary of the Haymarket riots, which eventually lead to the recognition of May Day. The Haymarket affair (also known as the Haymarket massacre or Haymarket riot) took place at a labor demonstration on Tuesday May 4, 1886, at Haymarket Square in Chicago. What began as a peaceful rally in support of workers striking for an eight-hour day exploded into a riot when a dynamite bomb was thrown at police as they dispersed the rally. The bomb, and then gunfire, resulted in the deaths of seven Chicago police officers, four civilians, and later four bomb makers were hung. No single event has more influenced the history of labor law in the United States. In 1935 Congress enacted the National Labor Relations Act 1935 to protect the rights of employees and employers, to encourage collective bargaining, to curtail certain private sector labor and management practices, and generally create a more peaceful management-labor process. 1) Be Consistent and Neutral on Policy Application. An employee walkout or absence for a protest is much like an employee absence for a vacation or a walkout over a disagreement. If you would let your workers off for any other reason, let them off to protest. Political rallies are often planned around midday so workers can use their lunch break to attend. If you normally let a worker run a quick errand, do so for a political rally. 2) Apply your policy as if politics weren’t involved. If you allow workers to take off with a minimum notice of 24 hours - let them off to protest. But if that same worker skips Monday without notice, take consistent disciplinary action short of discharge. 3) Political Speech may be protected. While political speech by private workers is not federally protected, there is a thin line with protest for immigration, women’s right, LGBT, religion, etc and you don’t want to guess wrong. Public­sector employees have a First Amendment right to speak their minds. 4) The NLRA bars acting against employees who engage in protected concerted activity. Expressions that have a connection to concerns in the workplace or working conditions, is fair game, even for nonunion employees. Potential violations of those protections under the NLRA may earn you an unfair labor practice charge. 5) Treat Political Speech like any other and Pass the May-Day Test. When political speech becomes hate speech directed to a protected employee category, an employer must act or risk facing an EEOC Charge or suit for permitting harassment or a hostile work environment. Employees at work could have a conversation about Auburn/Alabama football that touches on race, arrest records, aged fans tree killing, etc. and it offends a group of employees. The wise employer wouldn’t hesitate to act in that situation. A political conversation is no different -regardless of your grit-iron affiliation.